Hydrogen bonding is one of the most important noncovalent interactions in biological systems. 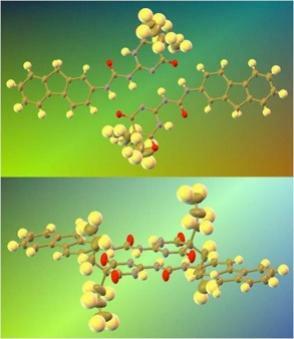 We are thus interested on the preparation of supramolecular assemblies using well-defined hydrogen bonding motifs. 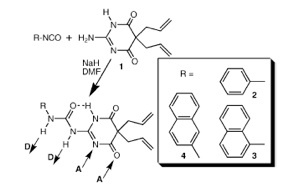 For instance, aromatic ureido pyrimidinedione derivatives (see scheme at left for typical structures) exhibit a donor-donor-acceptor-acceptor (DDAA) array which allows self-recognition to form highly stable dimers in solution and the solid state. We are currently investigating the structures and properties of homo- and hetero-dimers of this class, with particular emphasis on the effects that the two terminal groups may exert on each other. We are also interested on designing systems suitable for the formation of stable hydrogen bonded complexes in aqueous solution.